Kippure Estate, located by the Wicklow Mountains, is especially lucky to be able to offer some of the most stunning views in the country, making it ideal if you enjoy rambling. Whether you’re part of a walking club or you just want to take some time out with your friends and family, Kippure Estate is the ideal base for your holiday. No matter what your level of fitness, we have something for everyone. Discover rolling mountains, natural woodlands, gentle lakes and miles and miles of sandy beaches. You’ll be delighted by how easy it is to start your hiking adventures. Kippure Estate borders directly onto the famed Wicklow Mountains National Park, Ireland’s largest national park, as well as sprawling, state-owned forests. Cross a footbridge from Kippure over the River Liffey and you’ll be in the National Park, over 20,000 hectares dedicated to the conservation of biodiversity and landscape. Upland blanket bog and heath give way to winding streams and the deep lakes of the lowland, while wooded valleys and mountain slopes provide plenty of trails for you to follow. In addition, we’re just a short 25 minute drive from Glendalough, home to the renowned monastic settlement of St Kevin, a site of incredible archaeological interest. If you’d like the support of a qualified and experienced guide to make sure you don’t miss any highlights, we’re more than happy to arrange for you to hire one. If you’re looking for a challenging hike, then why not climb Wicklow’s highest peak, Lugnaquillia? At 925 metres, the sense of achievement you’ll experience as you gaze out across the countryside is unparalleled. With 20 other summits of similar size in the area, if you love mountains, you’ll be spoilt for choice. If you prefer something a little tamer, there are lots and lots of waymarked routes that will take you through valleys, forests and moors. Simply choose the one that suits the age and fitness level of your group. Whichever you choose, you’ll find that the routes are generally quiet and uncrowded, so you really do feel as though you’re in the middle of nowhere. If you’re lucky, you might even spot some of our native wildlife on your hike, much of which is protected under the Habitats Directive 1992. Keep your eyes open and you could see deer, hares, bats, badgers and even red squirrels. 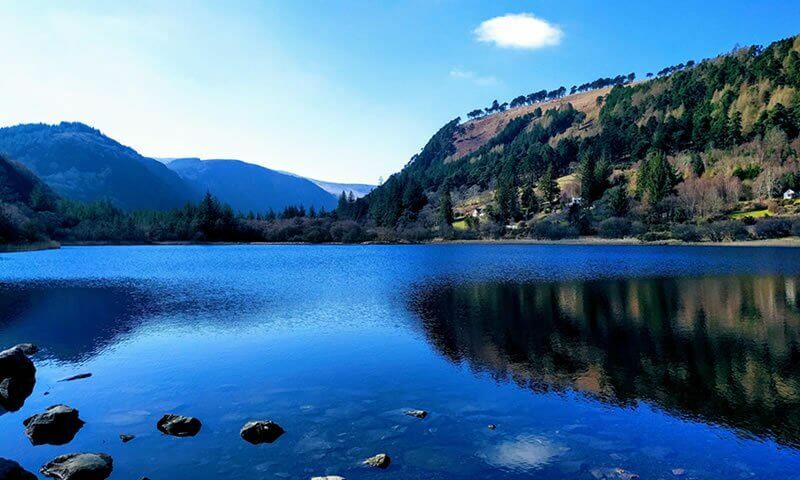 There’s so much to see in County Wicklow that you’d need weeks to explore it all! On your walks, you’ll discover quaint villages and towns as well as some of Ireland’s most impressive historic houses and gardens. If you’re a fan of ancient history, then you’ll want to visit the 5000 year old Seefin passage grave. There’s a mountain trail that starts from opposite Kippure Estate which takes you up a gradual climb up the mountain. This gentle walk is suitable for most hikers and will only take you an hour to reach the top where you’ll find the Neolithic tomb. As you climb, you’ll pass through verdant woodland, walk by Athdown Brook and see the Coronation Plantation from a unique vantage point. Once at the top, you’ll love the views across the Wicklow mountains and Blessington Lakes. There’s nothing like a healthy dose of fresh air to drum up an appetite and Kippure Estate’s chefs will be waiting to prepare you delicious hot food. We have menus to suit every taste and budget. Choose from simple, low-cost meals and lunches, freshly cooked barbecues, tasty buffets for special occasions right the way through to dinner cooked to perfection. All meals need to be pre-booked (at least one week before your arrival) for a minimum of 8 diners, meaning that you know exactly what you’ve got to look forward to when you return from your walk. We have plenty of accommodation available, with room for up to 120 guests across our lodges and guest rooms. All of our fully serviced guest rooms come with a private or adjoining bathroom. If you prefer self-catering, our lodges range from 2 to 4 bedrooms to suit your needs. They’re the perfect place to unwind while you take in the mountain views. Alternatively, you can enjoy a nightcap in our exclusive residents’ bar before retiring for the night. We have some fantastic value packages available for groups of all sizes (minimum of 8 people). If you book a break for our off season, you’ll enjoy a particularly good rate. (Our off season runs from November to March, as well as mid-week from Sunday to Thursday all year round.) Get in touch now and make Kippure Estate the base for your next walking break.